This article covers information on current Moscow transportation costs. Thanks to recent improvements in the Moscow transport fare policy and an introduction of new travel cards, getting around the city has become even more convenient and affordable for short-time visitors of the Russian capital. So, what were the main changes? Any of the Moscow Metro tickets and Metro travel cards are now possible to use for buses, trams and trolleybuses as well! It means that if you buy, let's say, a ticket for 5 rides or one day travel card Moscow or a monthly travel card, you may use it for all types of Moscow transport (underground and overground). These types of tickets are also known as “unified tickets” or “Yediniy bilet” in Russian. Tickets for 40 and 60 rides are also available. At the Metro ticket office (“Kassa”), located at the entrance of every Moscow metro station. Most popular tickets (for 1, 2 and sometimes 5 rides) can also be bought at ticket-vending machines, which are available in English. Cashiers are usually non-English speakers, so be patient. There are no “zones” in Moscow, so it doesn't matter how far your journey is. Metro ticket offices are open during the Metro working hours, that is between 5.30 am (5.50 am for some stations) and 1 am, and are available at each metro station. 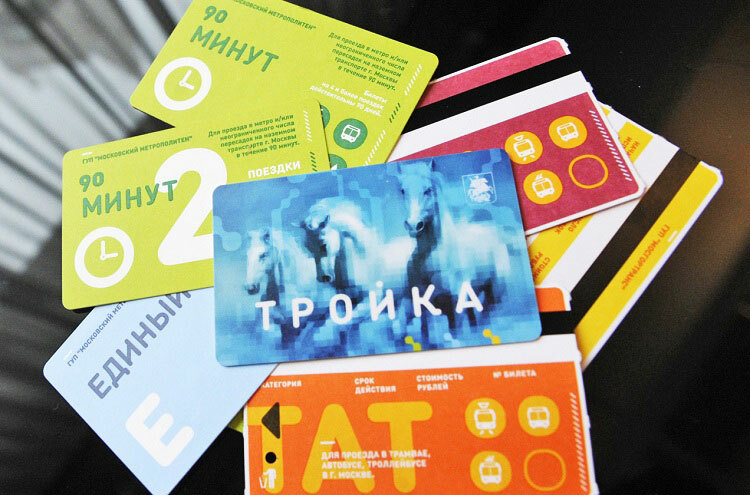 Troika card is a stored-value smartcard, which allows single and multiple rides on Moscow Metro / Moscow Monorail and overground transport at a reduced price. It can be topped-up with any amount up to 3000 Rubles. Troika card is distinguished from the others by an image of three horses harnessed abreast depicted on it. Via payment terminals of the following organizations, located all over the city: Credit bank of Moscow, Elecsnet, Europlat, Megafon. At Aeroexpress ticket offices at Paveletsky, Belorussky and Kievsky train stations. Troika is very similar to Oyster card of the London Underground, except it’s not that easy to top-up online for English speakers. All of the sites that accept online payments for Troika are currently available in Russian only. Are you going to stay in Moscow for some time? If yes, your Moscow tour guide can become the best source of information on any practical issues, including Moscow transport cards and best routes to your home! For those who prefer Moscow overground transport to the Metro and never mix the two, it is possible to get an “Overground Transport Only” ticket. Such ticket is called TAT (Russian acronym for Trolleybus-Bus-Tram), and allows rides on Moscow trams, buses and trolleybuses. Tickets for 20, 40, and 60 rides are also offered. From a driver when boarding the bus/tram/trolleybus. A single ride on Moscow marshrootka is either the same price as a regular bus/trolleybus or a little more expensive, so many locals just get on whatever arrives first. When using a marshrootka, pay with cash to the driver when boarding. No travel cards are available for such types of transport, unfortunately. Learn Moscow with your Moscow tour guide! Are you still not sure on the best Moscow travel card for your visit? Or would you like to get other practical information about the city? Your Moscow tour guide will be happy to help you out! They know the best places to shop, visit and dine out, and can provide you with lots of useful tips, so you just concetrate on what's more fun!